The Bavarian Beerhouse, Bristol’s authentic German restaurant and bar, is offering customers a great celebration of meat every Tuesday in January and February with a special ‘Meat Feast’ offer. 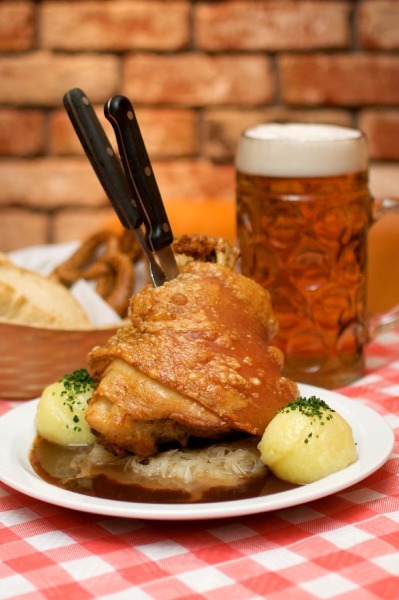 Every Tuesday throughout January and February, visitors to the Queen Charlotte Street venue will be able to purchase a pork shank and a stein of beer for just £19.90 – a saving of 20% on the usual price. Served with sauerkraut, gravy and dumplings, the roasted pork shank (known in Germany as a Münchener Schweinshaxe or Haxe) is cooked the Bavarian way – roasted in the oven to create a delectable crust. For their Stein of beer (or two pints) customers can choose from a range of popular German and Bavarian beers such as Krombacher Pils Bier and Erdinger Wheat Bier. The Bavarian Beerhouse, which opened in Bristol in August 2013, offers an authentic, original and unique Bavarian experience, with hearty German food and freshly tapped, ice cold beers, served by waiters and waitresses in the traditional costume of dirndls and lederhosen. Saturday afternoon it’s football time. The Bavarian Beerhouse is the only place in Bristol and the surrounding area to show Bundesliga (German football) on German television. From Mondays to Thursdays, the Bavarian Beerhouse is a traditional German restaurant serving hearty Bavarian food and German beers in huge stein glasses and on Friday and Saturday evenings, Bristol’s residents can enjoy an Oktoberfest party experience with live oompah music by DJ Schorsch from the Black Forest region in southern Germany. Throughout January and February, customers can buy a Meat Feast (a pork shank with sides and a stein of beer) for £19.90 only. Pre-bookings are necessary. To book, call 0844 330 2005 or email meat-feast@bavarian-beerhouse.co.uk.